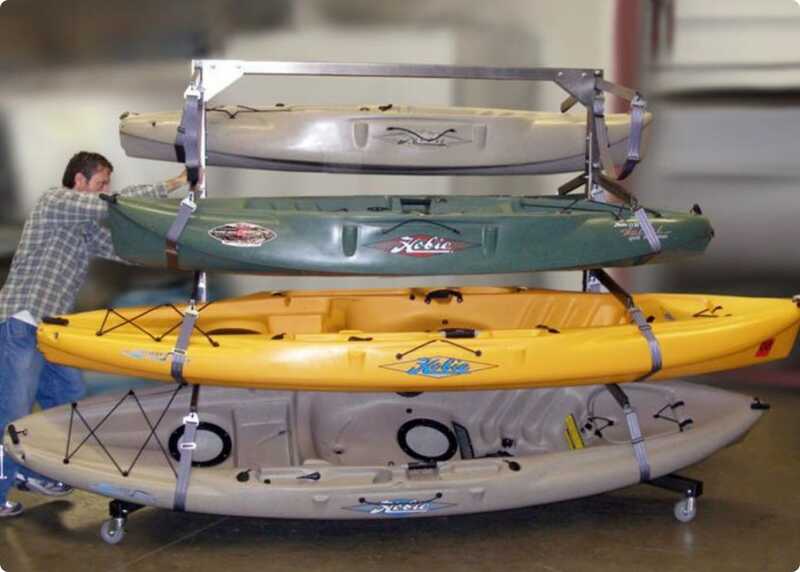 Easy Canoe & Kayak Storage in USA. Your boats come right to your finger tips with a push of the button. Add or remove boats in seconds. Push the button and up they go, safe and secure. The rolling cart holds eight boats. Receiving and inventory control is easy with the rolling cart because boats can go into safe storage directly off the truck. They won’t get dropped, dinged or scraped. Carts full of boats is a natural on the sales floor. Your customers can see and actually touch their boat and your regular shelves are open for more inventory. Some retailers roll a loaded cart outside and the colorful boats become instant eye-candy. Kind of a huge POP display. You can almost double your storage without a remodel. You are paying for dead air space every month. Think of the open ceilings in your storage areas. Now you can turn that useless space into active and very valuable canoe and kayak storage in USA. Boats stay safe from dropping and scratching. Aisles and floor space are clear and open. Inventory is a breeze and shrinkage is reduced. During off-season boats are safely stored up high and out of the way.